Coach Joyce Dickerson formed the Pink Panthers Double Dutch team over a decade ago in Hazel Crest. On a humid Saturday afternoon in a suburb south of Chicago, a group of about 10 girls are jumping rope. But they aren’t doing the simple single-rope tricks typically seen on area playgrounds. While navigating two long jump ropes, they are performing handstands and cartwheels. The Pink Panthers Double Dutch team has competed across the nation and around the globe. They’ve appeared on TV’s Steve Harvey Show and Windy City Live and in multiple commercials. Based in south suburban Hazel Crest, the team features about two dozen girls and young women from across the state. 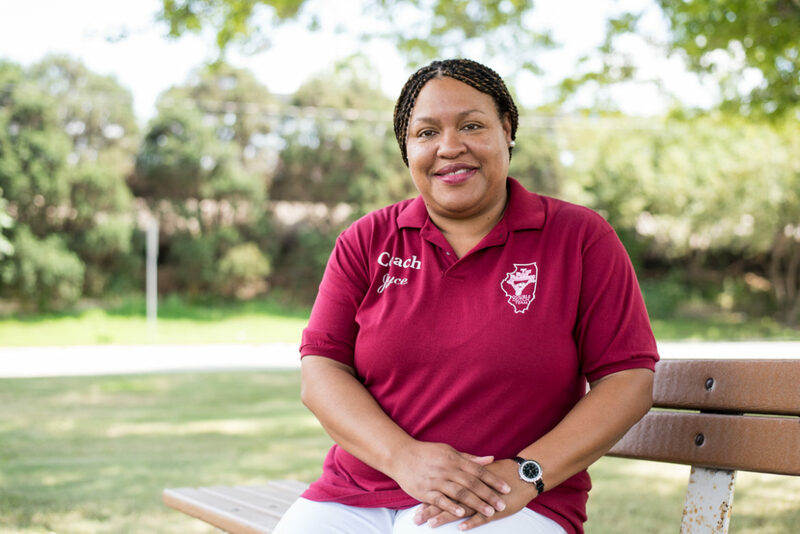 Coach Joyce Dickerson formed the Pink Panthers with two other parents over a decade ago and the team has grown in number ever since. The Reporter recently met with Dickerson at one of the team’s practices to talk jump rope and what jumpers learn from being a Pink Panther. Tell me a little about the Pink Panthers. How did it begin and how did you get involved? To be honest with you, my inspiration came from my daughter. You need three people to jump Double Dutch or even to teach Double Dutch, so I got with a couple of her friends, got them a rope and started jumping Double Dutch—and really the rest was almost history. We actually started almost 15 years ago with just a couple of girls and it grew very fast thereafter. It’s been a wonderful experience with the team. I’ve been exposed to people and places I would not have normally been exposed to. They’ve had the opportunity to do commercials. They’ve also been able to have several appearances on television and they’ve also been in several parades. We’ve been to over half the United States. We’ve competed with teams from Switzerland, New Mexico, Africa, Italy, Paris. The list goes on and on. What are the requirements to be a Pink Panther? You can start as early as five, and to be honest, you can jump when you’re 50. I was actually walking on a trail and I saw a group of women take out a rope — I wanted to say they were about 40 or 50. I was on the telephone and I was like, “Let me call you back.” (laughs) I went over there and turned for them and we all jumped. It is one of the fastest ways to get your heart rate up, because you’re using all of your limbs. Everything has to move at the same time. There is no audition required. I’m very passionate about the sport and there are many reasons why people want to jump. It could be that I want to lose weight, it could be for camaraderie, it could be to be a part of a sport. That’s one thing I love about jump rope — you can be thin, you can be big, you can be small, you can be short, you can be tall. Anybody can join. There are no criteria as far as learning how to jump. Before the Pink Panthers, I worked at Harris Bank for 25 years in downtown Chicago. When they were going through the different massive layoffs, I was probably in the third cut. I was sitting at home going, “What am I going to do?” and then that’s how the idea birthed. Whereas you would think being let go of your job could be a horrible experience, sometimes God has another thing that he wants you to do. I really think this was a gift. I got in it and I’ve loved it ever since. What skills do the girls gain from being on the team? One young lady who is at the University of Illinois in the engineering program, she called me and she said, “Thank you, Coach. Because of being a part of the jump rope team, I didn’t let any obstacles stop me.” She said “can’t” just did not come to her mind, because “can’t” is not used in our practice. Just constantly inspiring them and building them up, it’s a good feeling to know that they come back and they say thank you. The skills could be public speaking — we work with the girls on how to speak to interviewers or just speak in general. Sometimes we get a lot of shy girls and parents put them in so that they can learn how to speak to other people. They get a lot of skills that are not taught in school. In the school setting, it’s sit still and be quiet, but here you can just be yourself. It’s like putting a seed in a pot and just watching a flower bloom. We’re the water. We just kind of watch it grow up and watch it bloom. Can you share a favorite memory from your years coaching the Pink Panthers? That’s a really difficult question, because it’s so many memories. I’m going to go with one. When [team member] Carissa Townsend first came to the organization, we would have interviews, and at that particular time we had the demonstration team. We had them interviewed just to find out if they were mentally ready to be a part of the demonstration team. She had the skill set, but she was not mentally ready. Competition requires so much more dedication, and she wasn’t ready. Carissa — she’s always been a 3.8, 4.0 student — came in and said, “I’ve chosen to be around the wrong crowd. I’m very good in school, but I’m just not choosing the right people to be around, and since being a part of the team, I have developed new relationships and new friends and I’m going in a new direction.” She was in like the sixth or seventh grade! I came up from the table and I gave her a big hug, and now, she just graduated from the U of I so she’s going to Loyola University Chicago for law school. That was the best ever — to actually watch the kids, to give them the opportunity to be a part of something so positive and then watch them change as a result of that. It really takes a village to raise a child. It’s the mother, it’s the father, it’s the grandparents, it’s your aunts, it’s your uncles, it’s your community, and now I can say it’s the Pink Panthers. We’re there whenever they need us. Parents have come to me and said, “My child is going through this, can you talk to them?” I encourage them. It’s an extension of family. Watch: Members of Pink Panthers Double Dutch talk about what their the team means to them during a practice session.